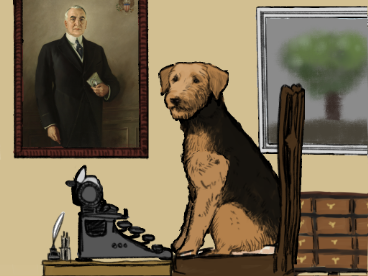 I didn't do a dev log this jam, but I figured I should at least announce the release of my game, 'The President's Dog'. It is based on the episode of the 'Something True' podcast about president Warren G. Harding's dog, Laddie boy. In reality, Harding wrote letters to newspapers and magazines under Laddie Boy's name. But in this fictional universe, Laddie Boy himself types them out, with your help on timing. This is a very short rhythm game with only two different inputs. I was trying for something similar to the Rhythm Heaven series of games. I didn't have as much time to spend on it as last time, so it came out a lot less polished than my wizard jam 4 game. I had to work fast to finish all the graphics. 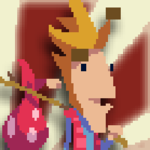 All of Laddie Boy's sprites are traced, and I just used an existing image for Harding's portrait. I also had to omit a proper tutorial. Still, I managed to finish it in time, so I guess it's been a good exercise in cutting corners to meet a deadline. Next time, I'll try to plan better. Looking over the other entries, I'm seeing a lot of great stuff. I look forward to playing other peoples' games and leaving some feedback during the showcase next weekend. I'm a good boy! I really like the art and animations for this, very jovial to go along with a fun little rhythm game. Short, simple and sweet! Very cute and the perfect length. Adding the carriage return as another "instrument" was a nice touch. It's a simple game and gag but oh man, with the nice presentation I found it really, really funny (using the carriage return never stopped being hilarious).